Company Profile – CHUKOH SEIKI CO., LTD.
An explanation of the company's outline is entered. machines to the local ceramic industry. The company primarily manufactured aircraft parts. Moved to Toki-cho, Toki-gun and incorporated Chukoh-Seiki Limited Partnership Co. as a cooperate factory to Kagamigahara-Aircraft and produced aircraft components. The company employed some 300 factory workers. 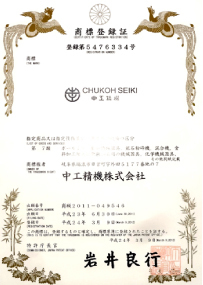 Re-organized to CHUKOH SEIKI CO., LTD. (a joint stock company). production to machines used by the ceramic industry. products for the ceramic, chemical and general industry. 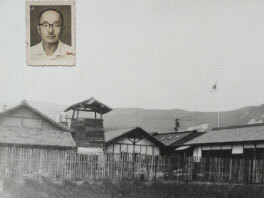 A new office was built and the factory was expanded. Expansion of the assembly shop. Comoletion of a new factory and a new office building. Installation of a double column 5-faces machining center. Construction of a new factory building D (300㎡）. Installation of a second double column machining centre. 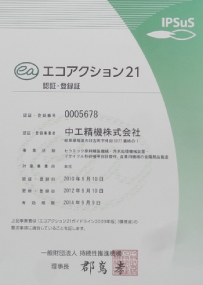 Acquisition of the Eco-Action 21 certificate. Chugoku Seiki has made "real things" exhibited by the company since 1925. Realize with accurate technology · quick action · sincere heart. We will refine creativity, constantly pursue improvements in technology and quality of development, keep delivery terms, and create true-hearted products. We will strive to contribute to society by improving technology and building materials that place importance on the environment. We will build a good human relationship and aim for a company with a free atmosphere. Thanks to the factory, we are blessed with the surrounding environment as a manufacturing factory. 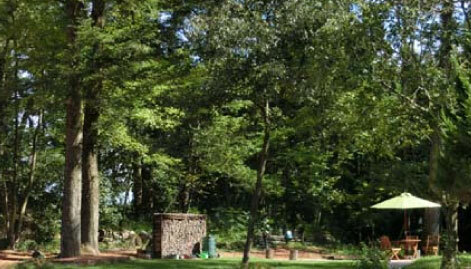 Surroundings are surrounded by trees and private houses are not nearby. We are proud to be able to produce in this natural environment, and at the same time we would like to continue to make products with due consideration to the environment. Around the beginning of the Meiji period, a good quality Kaito feldspar was discovered at the foot of Mt. In the crushing of the feldspar, a cylindrical tromel made of iron was used in Taisho era. 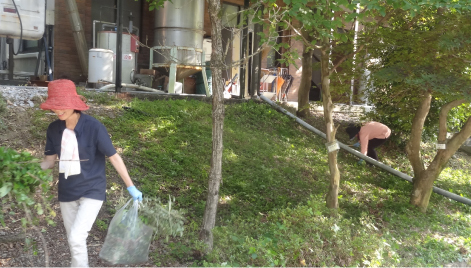 Using the water of the Sasagi River flowing from the mountain, we moved the water mill and moved the tromel. Also surprisingly when I was not using Tromel, I used a water mill as a power source for a jaw crusher. 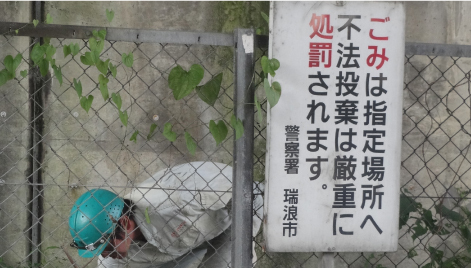 It was exactly the ultimate energy conservation practiced at that time. I think that we have been strongly involved with the production of tromel and sludge wastewater treatment equipment etc. from old days without considering our environmental situation so much. It is now desired that a global society be protected and a sustainable society to be created and there is no time to be sought. Recycling and reusing things like waste / landfill disposal. We will contribute even a little in fields such as creation of other energy to reduce fossil fuel consumption, development of equipment to store surplus energy. Although there are some areas already practiced, we would like to contribute even more strongly and consciously. I think that we do not see everything about our machines first. With our machine you can not make the final product as directly seen in the general market. However, I think that it is a machine that plays the role of so-called shade of such other people, the role under the rim, which is made of raw materials that can use our machine and produce good products using that raw material It is. September 2010 ECOACTION 21 Certification was acquired. September 2013 the Certification has been renewed. 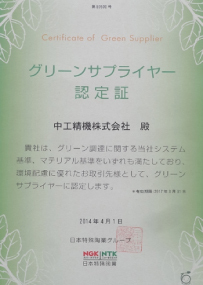 April 2014 Green Supplier Certification was given. 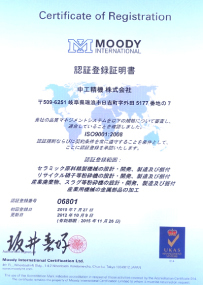 The certification was given by the group of NGK Spark Plug Co., Ltd.
５Ｓ campaign works are done once in two or three months in factory, offices, outside the buildings including neighbor public road. 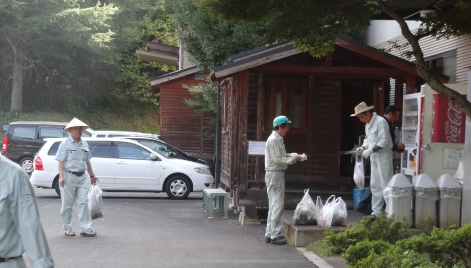 Picking up cans, bottles, poly bags, trash etc. thrown by car drivers at the sides of road.. 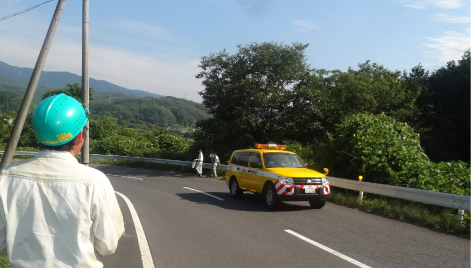 The crime of littering along roads never end. There are empty cans, bottles, pet bottles after driking coffe, soda, juices, water, also lunch food ware in poly bag after having lunch, empty paper or vinyl bags after eating snaks scattered road sides thrown out of windows by drivers. Picks up them and clean them up, but after a few days again same scenery be seen. The drivers who does not litter never litter, the drivers who litter always litter. The problem of littering on the road is this type of drivers "always litter". There is a proverb that the person who throw away will be thrown away himself someday. 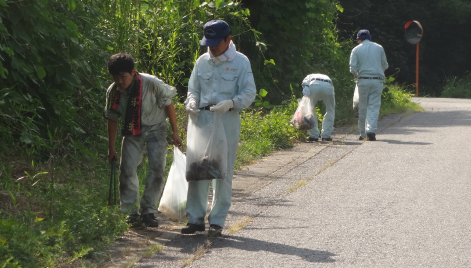 We want to stop the litterring and keep our precious place full of nature clean always. Construction and practice of Quality management system. Keeping record of manufacturing, control of quality and make good use of it for repair or mantenance after yeares.